This past week the DSU baseball team and softball team traveled out of state to take part in some spring break pre-season tournaments. The baseball team traveled down to Kansas, and the softball team went to Myrtle Beach, South Carolina. Photo from dsu.edu. Emily Kulp broke two DSU records for most homeruns and RBIs in a game. 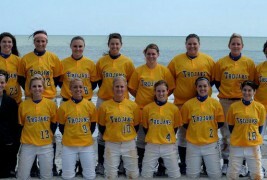 The softball team had a record-breaking trip at the tournament going 9-2. Their bats were hot as the team hit for an impressive .450 average as a team. They hit 13 home runs and they outscored their opponent 118-32. The base running also looked sharp, as they were 37 for 42 on stolen bases attempts. Amanda Shaw went 5-1 pitching and Alsia Balesteri went 3-1. In the second game of the trip Emily Kulp broke two DSU records for most homeruns and RBIs in a game. She had 3 homeruns and 8 RBI’s. The Lady Trojans next game is on March 22nd in Mitchell, SD against Dakota-Wesleyan. The baseball team had a rough trip down to Kansas, as they did not win a game. The Trojans struggled fielding the ball and giving up a lot of unearned runs. The Trojans did play some teams pretty close but failed to close it in the late innings. The teams leading batters were Jamie Barbour who had the only teams Homerun and batted .389 and had 3 RBIs. Chance Hargrove followed him batting a .350 and leading the team in RBIs with 6. Ryan Steffensen also had 7 hits and hit for a .250 average. Photo from dsu.edu. The teams leading batter was Jamie Barbour who had the only teams Homerun and batted .389 and had 3 RBIs. “The spring trip didn’t go as well as we would have liked, but we have a young team and we plan on getting better. Even though we didn’t win a game we did see some positives for our team. All the teams that we played were good teams with winning records and they gave us a good idea on where we are as a team and what we need to work on to become successful.” Stated Chance Hargrove. The baseball team was scheduled to play a double header on Thursday march 17th but due to the snow still on the field that game has been postponed.